Editor’s Note – The TOSH Top 25 is our countdown of the top 25 stories from the 2016-2017 school sports year, beginning with No. 25 and counting down, one story a day, to No. 1. The 2016-2017 high school sports year was filled with big performances, both team and individual. The act of narrowing down our initial list of top stories for our TOSH Top 25 stories of the year to just 25 was a difficult task. We asked people all over the state for input into our final list and beginning July 5, we are counting them down in reverse, from story No. 25 to story No. 1. Hopefully your favorite story of the past school year made our list. Today, we announce No. 16 on our list with a Timpanogos baseball team that was even more impressive in winning its second straight state title than it was a year ago. It was as dominant a season-long run as you will see, but when it came time for Timpanogos to put the cap its special season, coach Kim Nelson turned to an unexpected source. Injuries kept Cal Beardsley from spending much of his senior year on the mound, at least until the final game of the season. With the score tied at 7-7 and the bases loaded, Beardsley got the call, pitched out of the jam and finished out the final 2-1/3 innings of a state championship clinching win over Spanish Fork. The Timberwolves were not in must-win mode in that particular contest, but when the team in the driver’s seat, coming from the winner’s bracket, cedes momentum, you never know what will happen in a winner-take-all finale. Casey Hamilton provided the final margin of victory with a fifth-inning two-run home run and Timpanogos knocked off the Dons 9-7 in a game that opened with a 4-0 Spanish Fork advantage. Ending it without needing a second contest closed out an incredible season for the T-Wolves, who defended their state title from a year ago. This time, the team finished 28-1, with the only loss coming in the preseason Red Rocks Tournament against Shadow Ridge from Nevada way back in the middle of March. 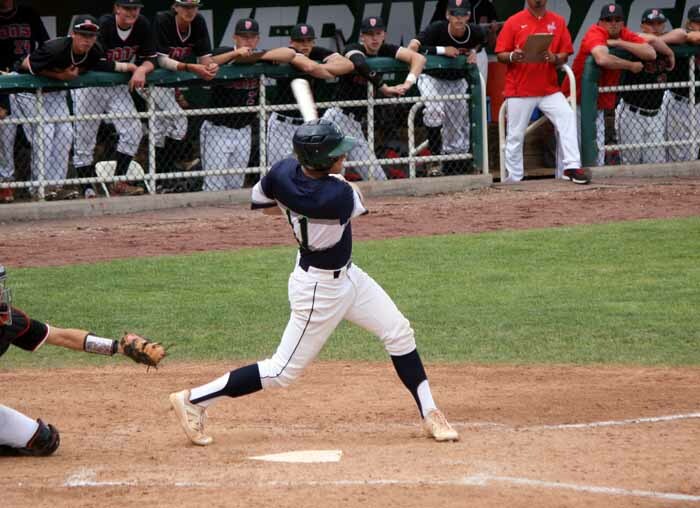 The state tournament run by Timpanogos was most impressive, including an 11-1 win over Judge Memorial, followed by 5-0 and 8-0 wins over Springville and Maple Mountain to reach the winner’s bracket finale against Spanish Fork. In that Wednesday game, Tyler Cornish did the heavy lifting for the Timberwolves, pitching a complete game in the 4-1 win and plating the first three runs of a dynamic pitchers’ duel with a bases-clearing, one-out, three-run triple in the fifth frame. The Dons provided a little assistance, setting up the bases-loaded situation with two errors and a hit batter, but that put Cornish in position to play hero. The senior, who was 10-0 on the mound this season, hit five home runs, six triples and 11 doubles as he led his team to another championship. With a team that included huge season-long performances from the likes of Conner Halford, Spencer Olsen, Jake Brooksby and Derek Eaquinto, it was the year of the T-Wolves in Class 4A baseball and that is the No. 16 story in our TOSH Top 25 stories of 2016-2017.